MiniZip - Compact and Cheap Power for your Lego Creations! Great idea. This should really help smaller creations. How long is the battery life? Thanks! The rechargeable battery that I offer lasts about 1/3 as long as the lego LiPo battery. This doesn't sound like too much, but who completely drains the Lipo box in one session? I found that by charging one battery while using the other, there is rarely a time where I am without a full battery. Thank you for the suggestion! I will try to incorporate this into a 'stretch goal'. The reason I have not done this already is that adding lego mounting points would considerably increase the size, something that not everyone wants. Perhaps a self-applied adhesive-backed mounting strip would be ideal. Great idea, but I see some problems..
1. A 9V battery will give you roughly 200mAh. If you connect a motor to it, I predict it won't last that long. Also, it's current is limited, so the motor might run slower (especially when the battery gets near-empty). 2. Alkaline 9V (when compared to alkaline AA) has a far worse money-to-power ratio. You just get less power for your hard earned cash. Same for NiMH. But granted, it's more compact. 3. (this really bugs me) 9V is a b* to plug in and unplug. And considering the limited capacity, you'll have to unplug it.. a lot. 4. I don't know where you'll source your 9V chargers and batteries, but be very, VERY wary if they come directly from China. In China there are many manufacturers of both fake brand (some very poor quality battery with a GP logo on it) and ludicrously-bad brands that will happily sell you a 30mAh 9V NiMH battery or something.. But it'll be marked as a 500mAh battery of course. 5. Same for the chargers. These can often carry fake safety-approval test marks. They have probably never been tested and if somebody's house burns down.. Well I wouldn't be able to sleep if I sold those. Again I don't know where you buy these, I'm giving you the warning just in case. Personally, I think it would be more interesting to have a cable that converts PF to 5.5x2.1mm female power jack. And also make some 5.5x2.1mm power jack 9V sources, like indeed a 9V battery, but maybe also a 3xCR2032 holder (very little power, but very small), 6xAAA, 6xC or 6xD (for all your heavy duty machinery) and 2x14500 (requires a special charger, but might actually be an interesting fairly compact option). Maybe 2x18650. Or even a 9V solar panel, why not! And obviously, it could be connected to a simple 9V adapter, powering it directly from the grid. With 5.5x2.1mm power jack, you could hook your creation up to anything! And while I'm at it, since we're on Eurobricks here, it kinda bothers me kickstarter projects always charge quite a bit extra for shipping to Europe. For last words, if I sound negative, I do get why you're making a 9V block PF adapter, but at least personally I'd rather have a more universal solution. Chances are I'm not your target audience, I would probably make my own cable when I decided I need something like that. W3ird_N3rd's objections not-withstanding, I think this is a great idea. Of course, the technique to do this should be widely known by now, but not many people are great with cutting a splicing, and ending up with a nice, neat cable at the end. The 9V battery offers a lot of flexibility... I would imagine if you're running an RC car or train motor, or operating a crane arm or something, it's probably not for you - but there's a ton of lightweight applications that would make this 10 times better than battery box. Looks like a neat solution. What battery controller electronics are included. For exaple, what stops the battery exploding when shorted out. For li-ion what stops the battery completely discharging ? I see this working only if there was a 9V block lithium battery or smiliiar. Normal ones simply drain too fast and cannot power too much stuff at once. The rechargeable 9v batteries that I offer have 280 mah. I found that by charging one while the other is in use I am hardly ever without a fresh battery. I found no noticeable performance drop in any of the models I tested it in (RC buggy, rock crawler, mini L motor rally car, etc.) From what I understand of electronics, a battery with a lower capacity can still provide the same power (amperage) but just for a shorter time. I found the batteries and chargers from a moderately well known brand. I ordered several and have been testing them. In fact, it is those batteries that are used in the video. The power jack sounds interesting. Sorry that extra shipping is needed for europe, but I guarantee you that what I charge for shipping is lower than what it actually costs. Thank yo for your feedback! Thanks! Yes, the average diy tinkerer could probably slap together a basic cable. But my hopes are that the good quality and low prices can offset that. The rechargeable batteries and chargers are a real deal breaker in my opinion, as the bulk pricing I found is much lower than what you could get for yourself. I tested this extensively in models with RC motors (some of my fast buggies) and I found that it was just as fast and powerful. Same thing goes for my rock crawlers, there was no noticeable performance drop either. The only thing that dropped was the run time; the 9v battery tends to drain quicker than the larger Lipo or 6 x AA battery boxes. I agree, the average tinkerer with electronics know-how could probably pull something off like this. But for those that can't, don't know how to, or want a refined finished product, this is probably the ideal way to achieve it. The 9v battery will be able to power as much stuff at once as a normal battery box, but just for a shorter time. If you use rechargeable 9v batteries (I offer them on my kickstarter as well as chargers) this shorter battery life shouldn't be much of a problem as you can simply replace the empty battery for a full battery and then charge the empty battery. But keep in mind that the main goal of this is so that you can build more compact models; there is a time and a place for a normal battery box. Like in your fox for instance. But the amount of stuff you can build once you don't have to worry about fitting in a bulky battery box is incredible. The battery that i offer is a rechargeable NiMh battery, which is very stable. As long as you don't intentionally short out the battery or dunk the whole thing in water, there should be no risk of shortage. But just to see what would happen I took the whole thing and put it underwater with the battery attached. After sitting there for a while, I pulled it out and disconnected the battery. It still functions perfectly. an adapter for lipo batteries would be cool. Not like lego ones, I mean like a 'raw' lipo battery. 9V lithium batteries do exist, but they are not rechargeable. Also, they are expensive (at least €6 and usually more). 2x14500 Li-ion would be only slightly larger and probably more sensible if you want more power. The rechargeable 9v batteries that I offer have 280 mah. That's just what it says on the tin. Did you actually test if it delivers this amount? Many manufacturers (unknown ones even more so) wildly exaggerate this spec. I found that by charging one while the other is in use I am hardly ever without a fresh battery. While interesting, it doesn't really quantify much because we don't know how you play with your models. Some good numbers that can be tested would be better. Charging time, runtime for various motors/lights. Also runtime when the battery has been stored away for a month. That's a difference between theory and practice. In practice, I foresee a talking microwave that asks a 9V battery: "Do you feel lucky, punk?". So EBL? From the top of my head, that's a Chinese brand. (correct me if I'm wrong) If you are importing this from China, there's a very real risk it's not even actually EBL. Yes, they even knock off their own brands. For the batteries it's mostly a matter of quality, but if a dodgy charger goes haywire the consequences could be far more serious. Yeah, USPS is pretty expensive. Given the small numbers I can't really think of a much cheaper option for this particular case. Just want to say I appreciate you doing this, just be careful. The 9v battery will be able to power as much stuff at once as a normal battery box, but just for a shorter time. @W3ird_N3rd Thank you for pointing out the flaws in my argument. I will test the batteries for voltage, amperage, mAh, run time on various motors and lights. I use my MOC's for about 10-15 minutes in one session. Probably every other day, but for the last week I've been using them every day as I was filming a youtube video. Thank you for pointing out my misconception a of smaller cell producing same amperage. Yes, EBL is a chinese brand but still has good batteries and reviews. I trust my supplier to give my EBL brand batteries. While it is true that 6AA cell batteries are capable of a MUCH higher current output than a 9V block battery (which has 6 tiny 1.5 cells inside it), in LEGO practice the current is limited to ~1A anyway. So while the 6AA batteries may be capable of much more than 1A, you will never get it out of the battery box. So as long as the 9V battery is capable of 1A, you won't see any practical drop in performance. In other applications (like R/C), the difference would be immediately noticeable and unmistakable. 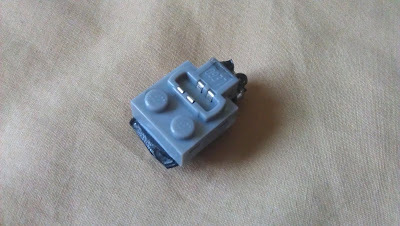 That seems kind of pointless, lego already makes a case for a 9V battery and has an adaptor cable to connect it to PF motors. @S.I While some sort of attachment system to lego would be nice, I agree that a full case would add bulk and take away the main benefit of a 9v battery - it's small size. @Blakbird I will test the 9v battery today for current draw and get back to you. The lego power function battery box overload kicks in at around 1 A, correct? So therefore a fully charged 9v battery can provide just as much, if not more, current as a 6 x AA lego battery box. I have used something very similar with a single PF M motor. After running for an extended period of time, the motor started slowing down and smelling funny - any idea why?